The C-130 has been the workhorse of cargo aircraft for the the Marines and the Air Force since it entered service in 1954. As of 2009, there have been more then 2,300 produced and, with the advent of the C-130J “Super Hercules”, is one of the few military aircraft to have been in production for over 50 years. But for all of its accomplishments, the C-130 isn’t something you’d think of as a carrier based aircraft. But for a time in 1963, it was. One of the challenges of carrier operations is the taking on of supplies and replacement personnel. In 1963, this role was handled by the Grumman C-1 Trader, but this aircraft wasn’t well suited for the role. 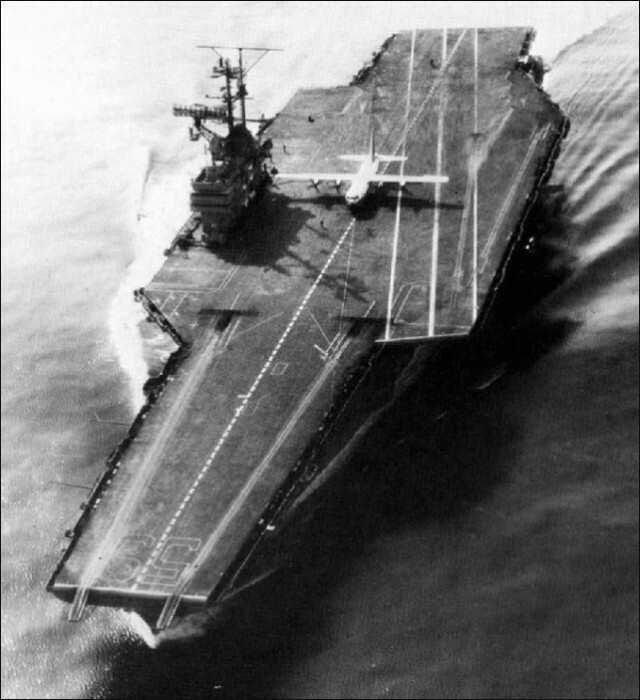 It had a limited payload capacity and a range of only 300 miles, meaning a carrier that was operation mid-ocean had to reposition itself close to land to take on supplies from the Trader. 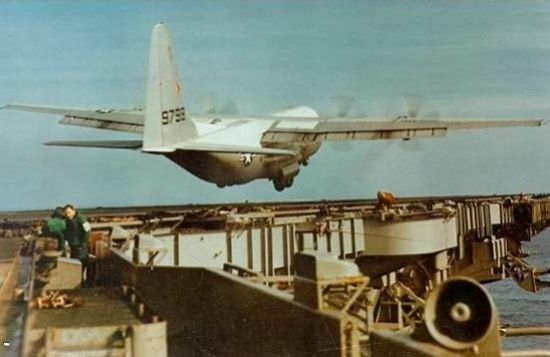 This, as you can imagine, was a problem, so in 1963 the Chief Of Naval Operations ordered a feasibility study of using the C-130 as a “Super COD” (carrier onboard delivery) aircraft onboard the U.S.S. Forrestal. KC-130F on the deck of the Forrestal. This picture shows the extremely short roll-out that the KC-130 used after landing. The aircraft to be utilized for these tests was a KC-130F Hercules that was on loan from the Marines. Lockheed made only a few minor modifications to the aircraft in preparation for these tests; a smaller nose-gear orifice was installed, the anti-skid braking system was improved and the underwing refueling pods were removed. Crewed by Lt. James Flatley, copilot LtCdr. W.W. Stovall (neither of whom had flown a four-engine aircraft prior to this test), flight engineer; ADR-1 E.F. Brennan, and Lockheed engineering flight test pilot Ted H. Limmer, Jr, the modified KC-130F began its trials on October 30, 1963 and, with the Forrestal steered into a 40-knot headwind, made 29 touch-and-go approaches, 21 un-arrested landings and 21 unassisted takeoffs, with gross weights ranging from 85,000 pounds up to 121,000 pounds. The aircraft performed above expectations, coming to a complete stop in 267 feet at an 85,000 pound weight (this is just a touch more than twice the C-130’s 133 foot wingspan) and 460 feet with a maximum payload. More astonishingly, the aircraft was able to takeoff utilizing only 745 feet of the deck. 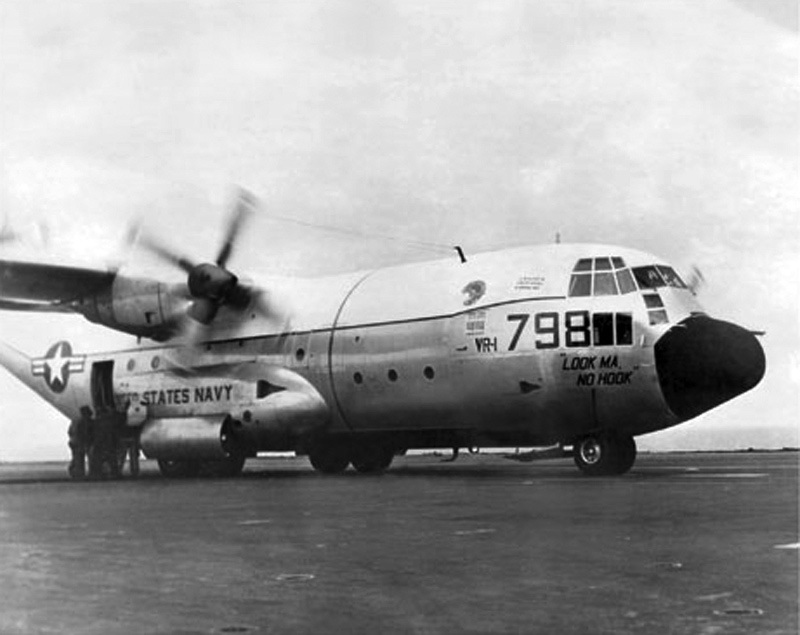 After evaluating the test data, the Navy decided that even though the C-130 would be able to deliver 25,000 pounds of cargo and have a range of 2500 miles it was too risky to utilize the aircraft and instead opted for the smaller Grumman C-2 Greyhound, which still servers as the Navy’s primary COD aircraft.